Our next adventure was a ride on the metro. The bus took us to the Arc de Triomphe, so that we could take the metro to our "rallye" in Montmartre. We learned all about the Paris Commune. 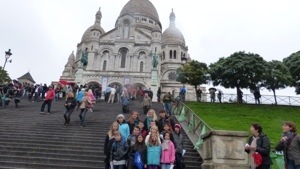 The children were very impressed to see Sacre Coeur. What a beautiful building! We also got a wonderful view of the city even with the rain. We took the metro to the Louvre after our "rallye" in order to go to the Virgin store to buy our French books, but we were disappointed to find out that the store is no longer there! Fortunately, we were able to make another plan, and the bus brought us to another Virgin store in Paris. 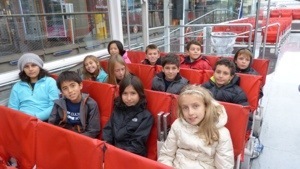 The students were still able to buy French books, and they were all very content. After a long and interesting day, the students were happy to get back on the bus to head home to their host families. They will spend the Sunday with their host families.